Spring has sprung! Now is the best time to pep up your lawn and give the turf a makeover before summer. By having a healthy lawn you will be maximising your lawns’ drought and shade tolerance as well as helping combat weed growth. Start by giving your lawn a nourishing feed with an organic or conventional fertilizer that can be purchased from your local garden centre. 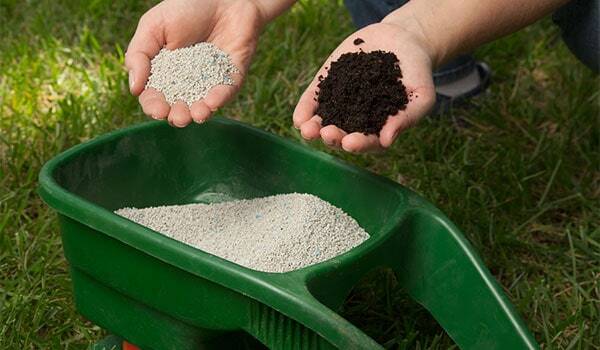 Remember to apply your fertilizer with a spreader for even distribution, and be sure to follow the instructions on the packaging. It is important to water it in if required to prevent the fertilizer from burning your lawn. Fertilizing can mean additional mowing, however the result is that the grass will have a dark green colour and will kick start growth into summer. Spring is also the ideal time to top dress your lawn if it is needed. The main reason you should top dress your lawn is to fill any low spots and dips or you may need to raise the level of your lawn. Once you have mowed your lawn, use a quality sandy loam soil and spread it evenly over the lawn. Leave it a couple of hours to dry then using a turf level-lawn rub the soil into your existing lawn. Don’t water the lawn for 2 to 3 days. This is to allow the grass to shoot through the soil easily rather than trying to grow through the crusty top you get after you have watered your top dressed lawn. Top dressing encourages your lawn to grow into the soil medium resulting in a lush thick healthy lawn. So remember, with a little work now your lawn will be healthy and lush ready for the warm season. For any queries regarding your turf, don’t hesitate to call Hi Quality Turf on 1800 040 981. Alternatively, shop online, or pay us a visit and check out our turf varieties — see address and opening hours.